Devine’s geometric sculpture, this pairing of recent works juxtaposes the different subject matters and materials to reveal the possibilities of abstraction through organic forms. Breaking from the historical canon of abstract painting, Kincaide emphasizes the hidden, internal landscape of her figures. Through control and spontaneous disruption, she conveys texture, design, and abstraction through her painted flora. A strong advocate of structurally applied color, her work explores anonymity and transformation. Incorporating elements of fashion photography and contemporary socio-cultural emblems of status and identity, her figures define the separation between body and mind. 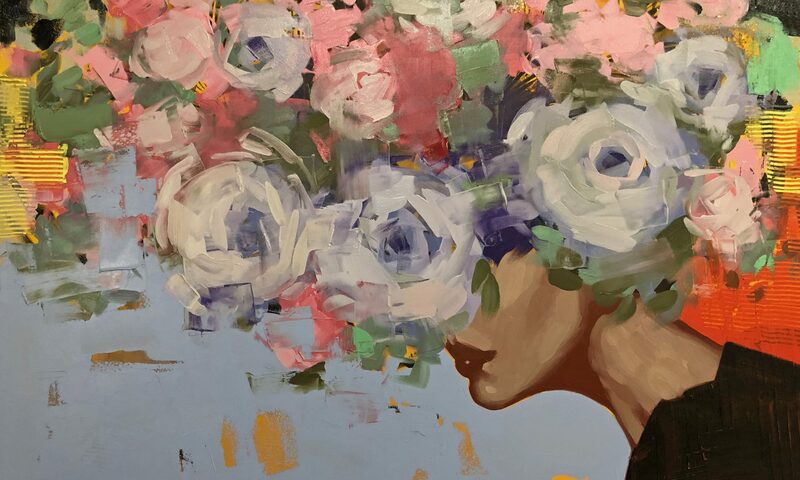 Bursting forth with florals, Kincaide’s figures showcase the idea of ambiguity between our bodies, identities, and thoughts. Recognized for his primary colors and curvature, Matt Devine’s organic forms contribute to his signature sculptural style of harmonious contradictions. Distilling pared-down compositions from industrial materials, Matt Devine coyly flirts with geometric abstraction while recording the modern world around him. Sculpting in steel, aluminum and bronze, his sculptures stand in perfect balance as they convey a feeling of aerial lightness that contrasts the materials they are made with. Transforming raw material into patterned shapes, Devine’s controlled manipulation of space reveals the contrasts of nature and industry, light and shadow, and chaos and order.